A character I've been putting off for some time now. A space control zoner with an emphasis on offense, much like how she is in Hopeless Masquerade and Urban Legend in Limbo, her Specials utilize a system akin to the Persona cards in P4A. For those unfamiliar with the system, all of Mamizou's Specials, with the exception of Animal Lute Priest, are directly tied with the 4 leaves that Mamizou begins the match with; if Mamizou is hit at any point while one of these Specials is active, Mamizou will lose a leaf, and will be unable to further use any Specials, aside from Animal Lute Priest, once she has lost all leaves, at which point Mamizou will automatically regenerate her leaves after a short time. Youkai Tsurube Transformation. A delayed projectile. Like most of Mamizou's other Specials, it requires Mamizou to have at least one leaf. Those familiar with Persona 4 Arena should be familiar with this mechanic. 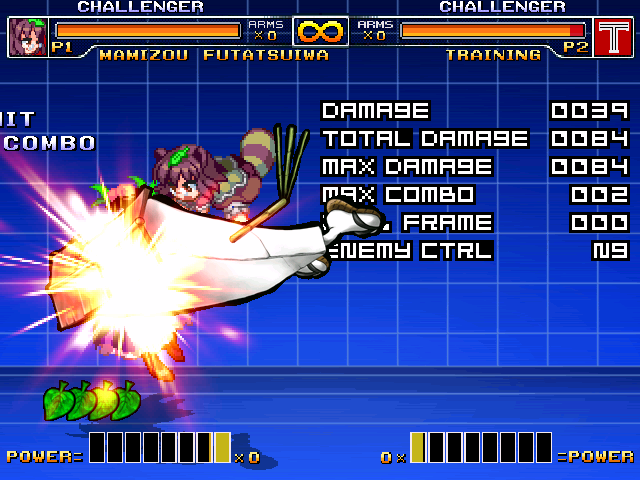 Mamizou can throw out to apply pressure, but hitting the bucket causes her to lose one of her leaves. 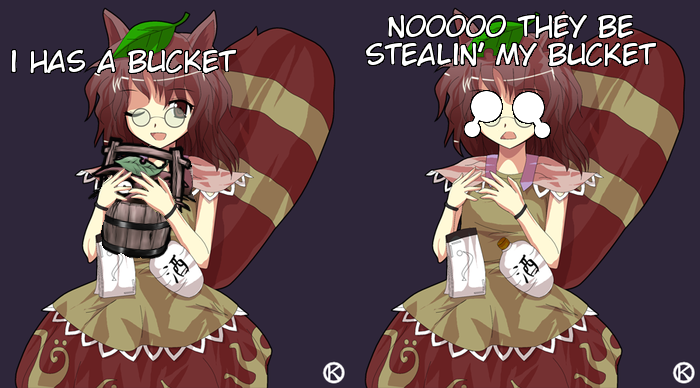 An alternate version of the Special will cause Mamizou to simply drop the bucket in place, much like the skill's alternate version in Hopeless Masquerade did. Its not very often that I post a dev update regarding normals but, here we have Mamizou's j.HP. Used almost in a similar fashion as her 8a from ULiL, except without the groundbounce portion during the latter part of the attack. Pretty sure there's an actual name for the wall youkai her tanuki is transformed as, but if you've played ULiL you'll recognize this as Mamizou's 2a attack, now her j.2z. Pretty much works in almost the same way, except it only hits once due to complications that arose from trying to get it to hit multiple times like in source. It knocks down and hits OTG as well, just don't expect it to beat out too many anti-airs. Animal Lute Priest, the only one of Mamizou's specials that doesn't require the use of her leaves. Extremely useful zoning tool for applying offensive pressure, despite its low damage. Utsusemi Jizo Transformation. Has an interesting property where, if the move whiffs during the fall, the opponent can be hit by the shockwave caused upon landing, but will deal noticeably less damage. Expends 1 leaf if Mamizou is hit after transforming into the statue. Youkai Tsurube Transformation. An incomplete version of this move was shown earlier, but this is also the perfect opportunity to show off Mamizou's leaf system, which is not only taken from source, but heavily inspired by Persona 4 Arena's card system. In Mamizou's case, Youkai Tsurube Transformation will expend a leaf whenever it gets hit, including by melee attacks. Mamizou will have to wait until her leaves recharge once they are all expended before she can use any of her Specials again, but Animal Lute Priest, as previously mentioned, is the only exception. Bunbuku Hot Soup Bathtub, the first of Mamizou's Level 1 spellcards taken from Hopeless Masquerade / Urban Legend in Limbo. Unlike the source, this starts up a bit faster and has startup invulnerability, so it can be used as an effective reversal outside of combos, unlike in source, where her other Spellcard, "Youkai World Gate of One Hundred Demons", served the purpose of both reversal and projectile zoning, which made it a bit too good imo. Will go more in depth into that when the time comes, which should be soon. It was considered at one point, but unless the target character has precoded compatibility (which none of GR's roster does) it would be difficult to get working right. "Youkai World Gate of 100 Demons". Mamizou's projectile super. Although it may not seem like it, Mamizou can still be hit out of this attack during the startup, as her hitbox extends a bit downward. Also hits OTG, so it can be used to get some extra damage off at the end of a combo.